Hayate: Yameru te... ojou-sama no... nande? Nande? Doushite? Maria: You said it yourself too, didn't you, Hayate? Maria: Our roles are over. 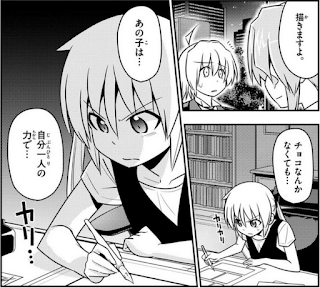 Maria: I've noticed it since the doujin showdown with Ruka. Maria: She gave it her all. During that time when her heart was broken. Maria: She would always come to me to be consoled. I thought that she would never be able to stand on her own. "However... a hero, even when on a broken knee..."
Maria: I was shocku deshita! Maria: Her growth, I had underestimated it. Maria: She had been relying on me like a mother. Maria: Whatever I thought was bad or whenever I said no. Maria: I think, that was where my existence was heading. Maria: I didn't care anymore about her growth. 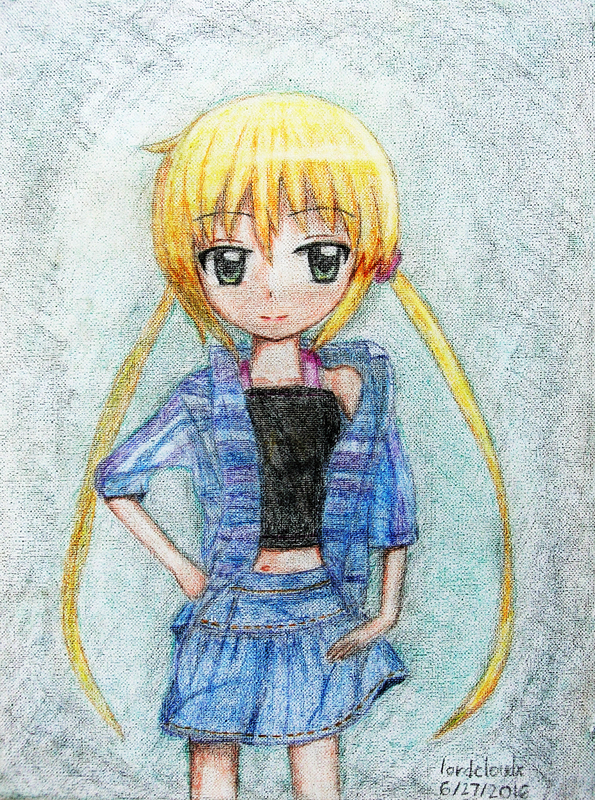 Maria: Her growth is also thanks to you, Hayate. Maria: Ever since you appeared, her world has been opened. 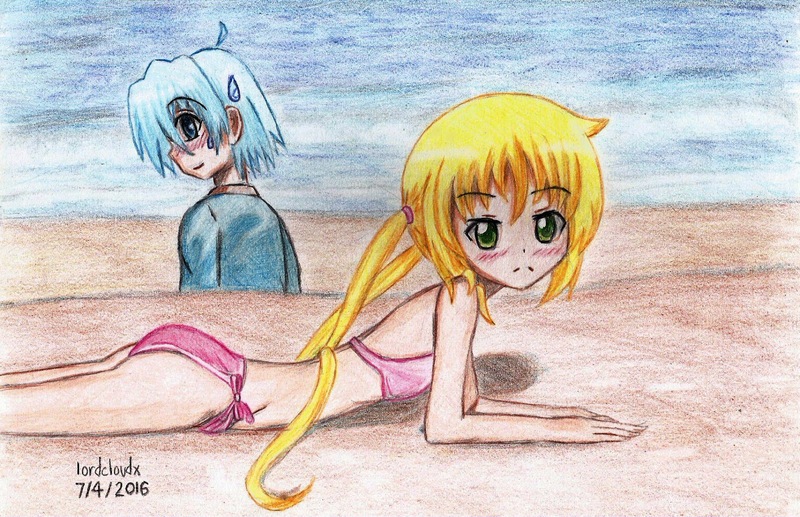 Maria: You think she has changed as well, don't you, Hayate? Ah yes, this is one of the reasons I fell in love with her. 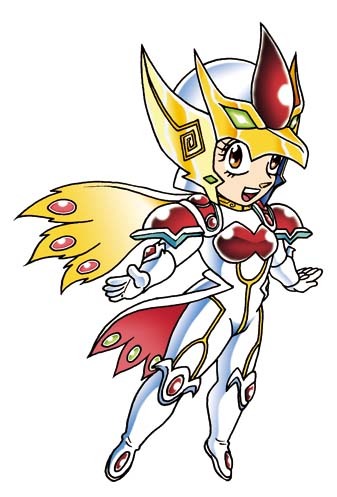 My ideal heroine... and ideal waifu. 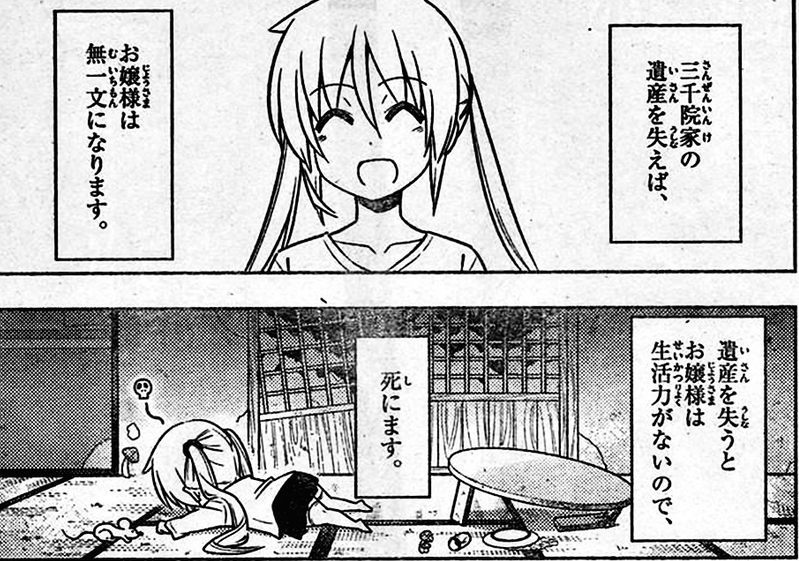 Hayate: :'( She... hasn't changed... right now, she can't draw her manga without any choco, right? 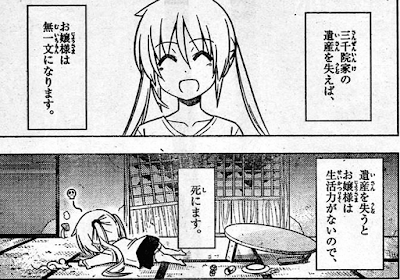 Maria: Perhaps if I were with her right now....I would just have cleaning and cooking to do, like a real maid. 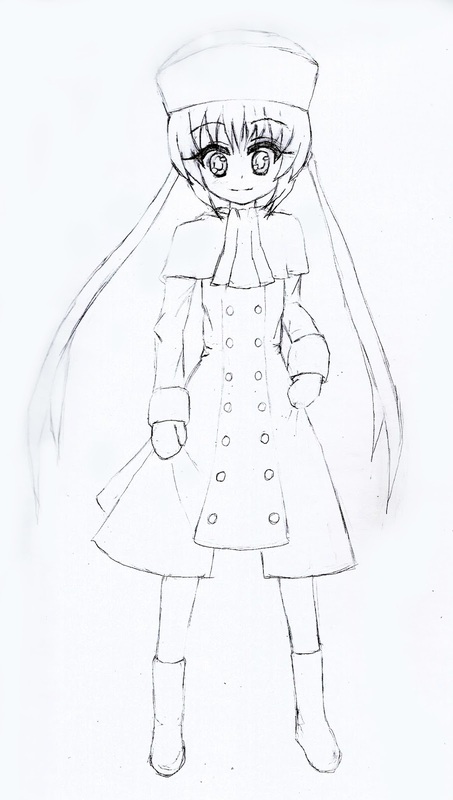 Maria: She is steadily growing up. I can't even catch up to her anymore. Maria: This is unpleasant for me. Maria: This may just be self-indulgence, but I want to be special to her. Maria understands... she really does! Maria: This is why my being a maid ends here. 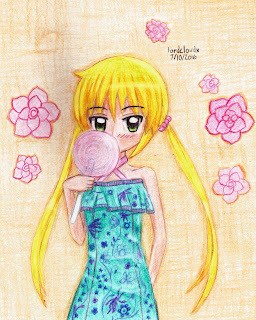 Maria: Hayate-kun... do ya remember? Maria: I'll be turning 18 soon, right? 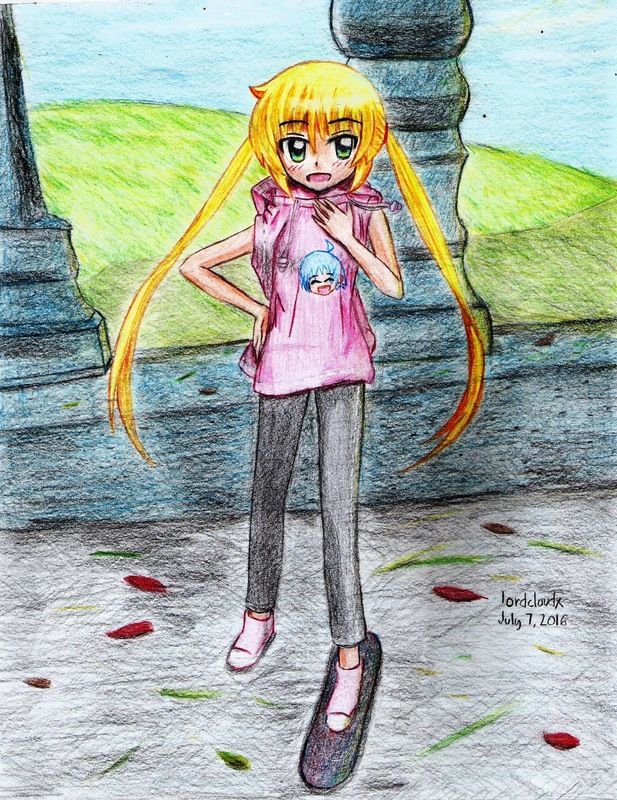 Maria: So won't you please smile? Chiharu: Here, I've bought enough choco, amirite? 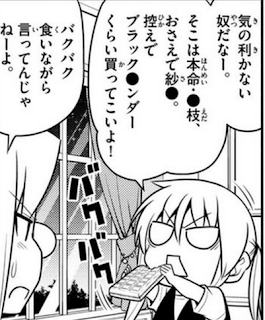 Nagi: Meh, why is it this kind of choco nanoda? Chiharu: Stop talking and making those baku baku sounds while eating. 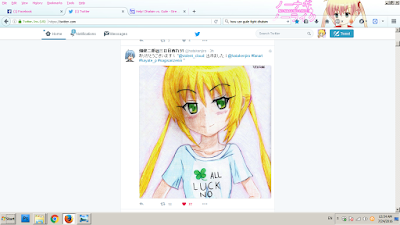 Chiharu: Anywayz, howz the drawing going? Lemme have a look. Chiharu: Ah, it's progressing very well. Chiharu: Think you can make it in time for the awards? 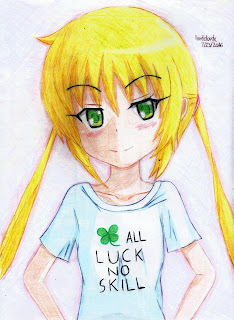 Nagi: Hmph! 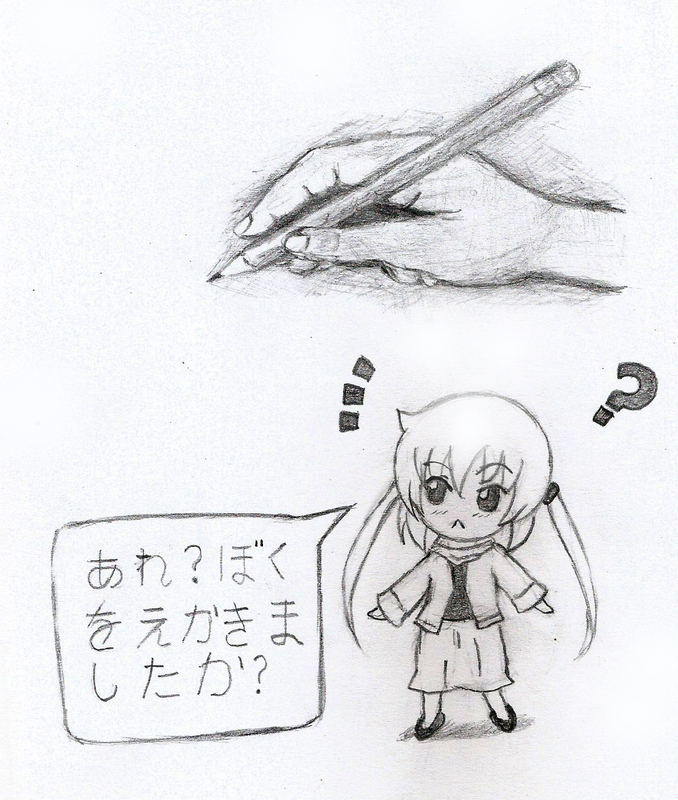 Of course nanoda! Chiharu: Btw, where are Ayasaki and Maria? 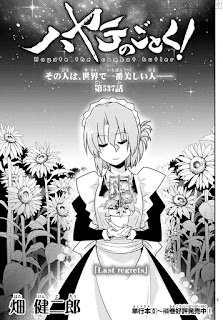 Back to Hayate who is alone outside the Violet Mansion now reflecting on Maria's words with a sad look on his pitiful face. 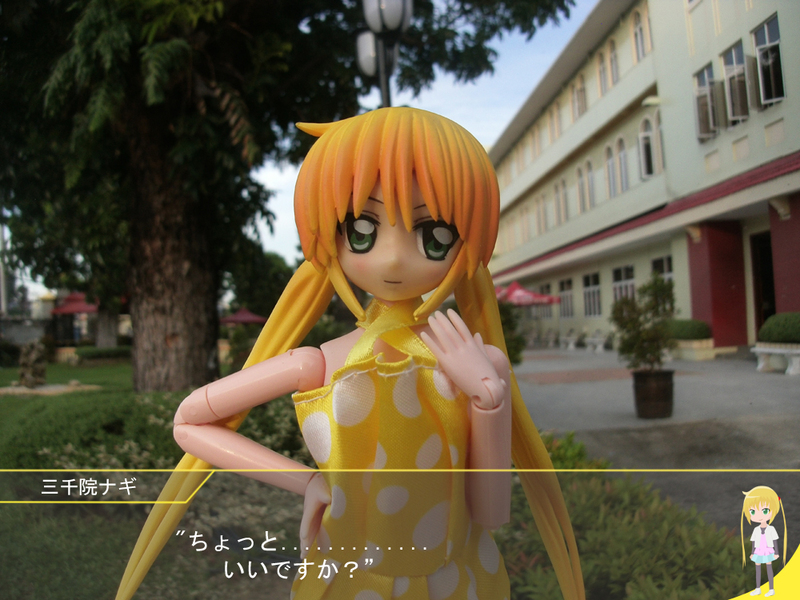 Maria: Keep this thing a secret from Nagi, ok? Maria: I haven't decided on a specific date yet. 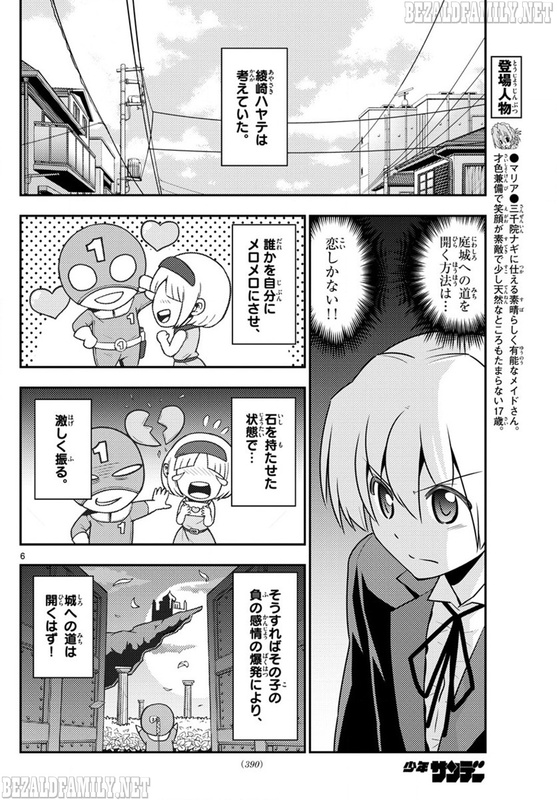 Maria: At the latest, it might be around my birthday. Hayate: Maria-san is quitting... Maria-san was always with ojou-sama. 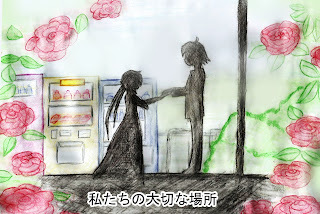 Hayate: The ruins of the royal garden.... the last game...I should get the key, right? 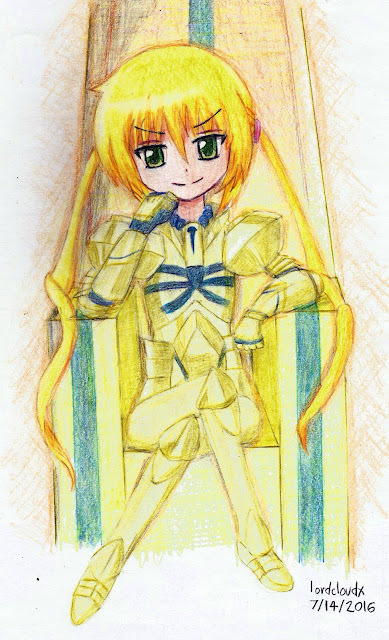 Hayate: There's also the matter of mini-athena. 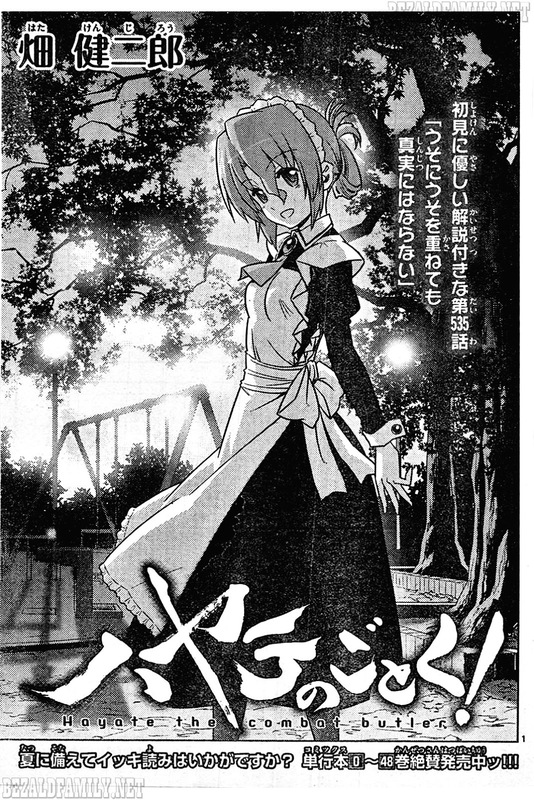 And Housen is a maid...and wtf is up with these King's Jewels and the Royal Power? Hayate: Anywayz, these are the keys to opening the Royal Garden but... I need an explosion of negative emotions to open the road. Hayate: KUSO! WTF DO I DO? Housen: Royal Family servants really give me a hard time. 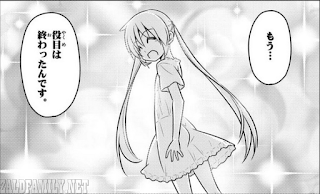 Review: Well, I'm definitely quite happy with Maria's assessment of Nagi in this chapter. Hayate thought that Nagi would end up in the poorhouse and die if she didn't have her inheritance but Maria is now putting some doubt in his head as to his mistaken beliefs. 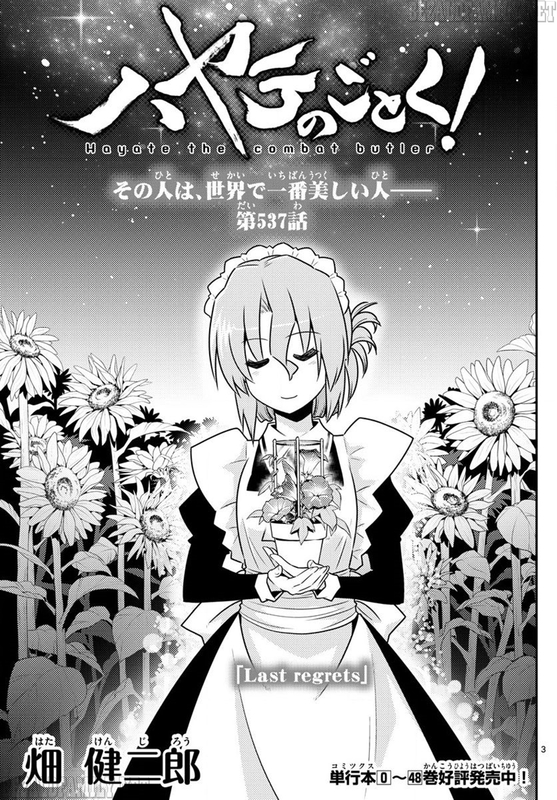 Also, I totally called it in the previous chapter as to Maria's reason for quitting being a maid. 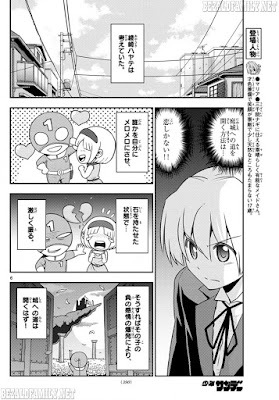 At least this proves that there are indeed times wherein Hata-sensei foregoes unpredictability for the logical outcome of the plot structure. Maria even makes a callback to the time in Ruka's arc wherein Nagi first demonstrated independence to her. It's quite funny that while Maria has maturely accepted that Nagi is growing up, Hayate seems to be the complete opposite and had a very disturbed look on his face when Maria mentioned this. 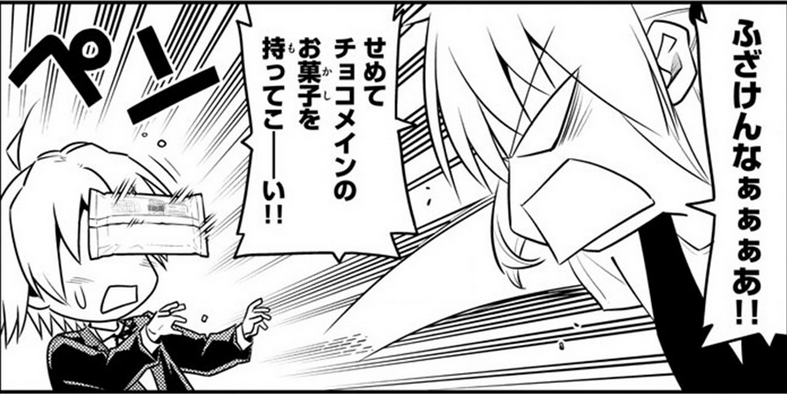 He even goes as far as to deny it for a flimsy reason such as Nagi being Nagi and asking for chocolates. Fortunately, Maria rebuts him quite firmly. 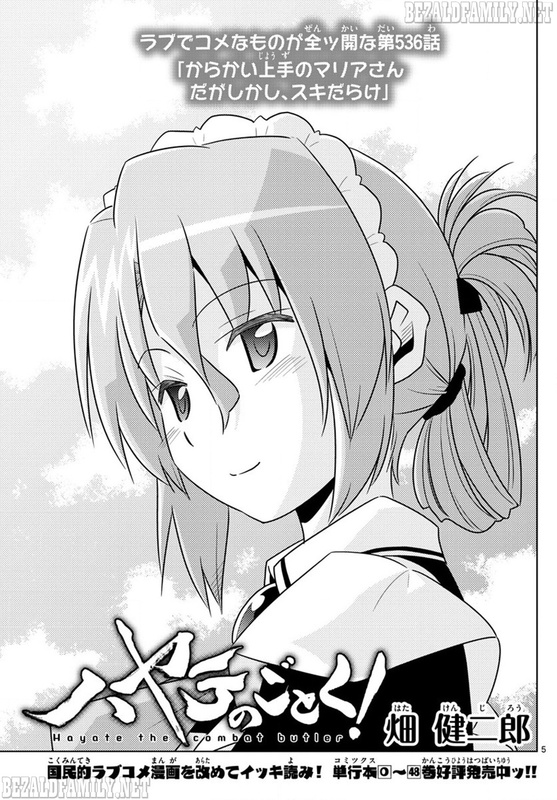 It would seem to me that Hayate has an unhealthy obsession of being "needed" by Nagi and that is why he is total denial mode once Maria mentions Nagi's growth and independence. 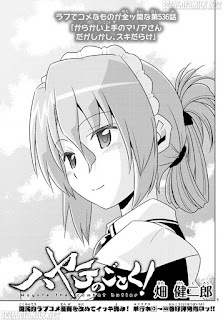 It would most likely be because he has anchored the worth of his existence to being needed by Nagi -- pretty much like Maria herself, except he's not mature enough to accept that it might not be the case anymore. Really, it's been a long time coming. He should just realize that Nagi does indeed need him, but not to protect her nor perform mundane household chores for her. 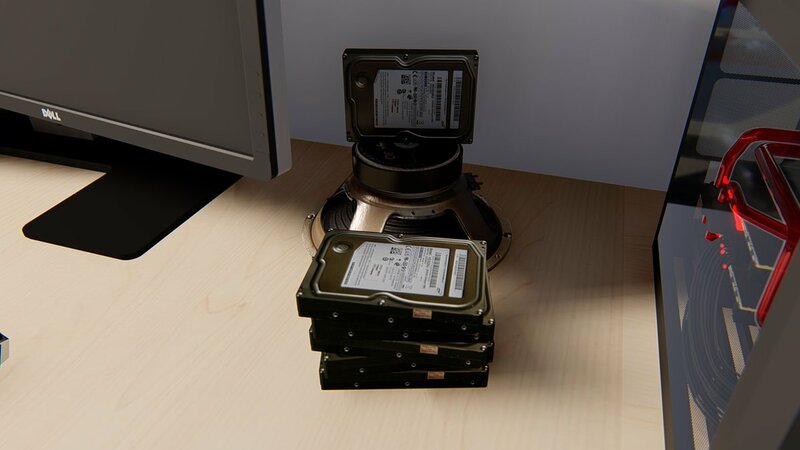 Calling it now, this will be a future development in the series. 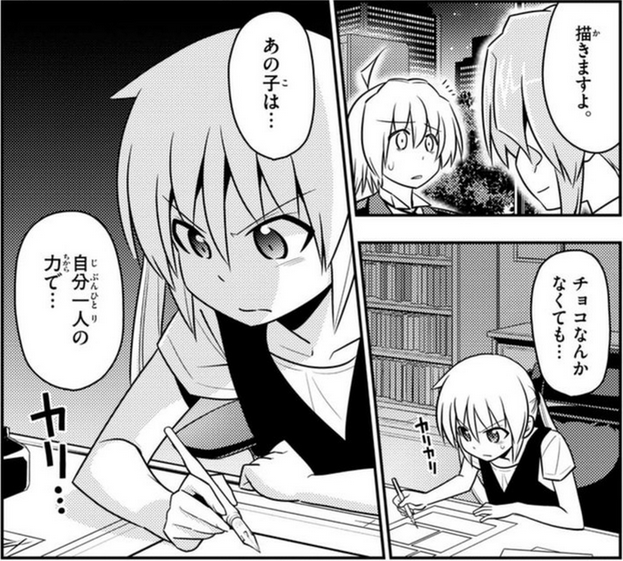 One thing has become certain here: Hata-sensei is intentionally withholding Hayate's reaction to Nagi's manga from us. 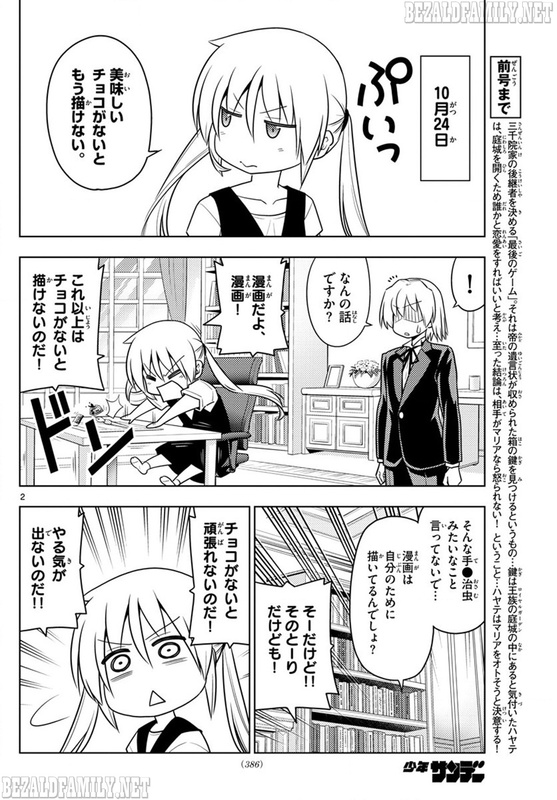 Hayate reflects on various things in this chapter and mentions in passing just about all of the current unresolved plot threads from mini-Athena to the king's jewels, but he never ever touches upon the meaning of Nagi's manga. So yes, something is up here. As one familiar anon commenter mentions in my previous review, it might not necessarily be a good thing -- but something is definitely up. Lastly... whoa... ok, so Housen's power level is over 9000 apparently. She easily fought Hayate, Tama and Isumi all at once and now she's defeated Machina and taken his King's Jewel... although she did mention that it wasn't easy. Of course, you can see that she doesn't have a scratch on her while Machina is all beat up. Anywayz, really awesome chapter and Nagi chomping on chocolates never gets old. SEE YA NEXT CHAPTER! Fanart Corner: Got some new stuff this week. The original pic. Eyes inspired by Prisma Illya. Showing a little versatility and contrast of styles here. Still unfinished. Nagi in Illyasviel's signature outfit.